This track is off of the Deluxe Edition of Royce da 5’9’s Street Hop. Get it on iTunes now! Since the Pistons didn’t make the playoffs, Big Sean seems to be riding with the Lakeshow? Click HERE to download this song. Big Sean speaks on his collab with Pharrell called “Donald Trump,” which will be on his upcoming album, Finally Famous. Click on the picture above to watch the video! TheHipHopUpdate.com’s Taylor catches up with Big Sean at University of Arizona’s annual Fiji Islander party, where the G.O.O.D. Music representer performed along with Chiddy Bang. Big Sean addresses the latest track leak with Drake (“Made”) where he explains that the official version is different (musically, verses) from the prematurely leaked version. Sean touches on his original group with HHU friend Pat Piff, working with Pharrell & the Star Trak team, the Finally Famous brand, how he linked up with Mike Posner, and more. 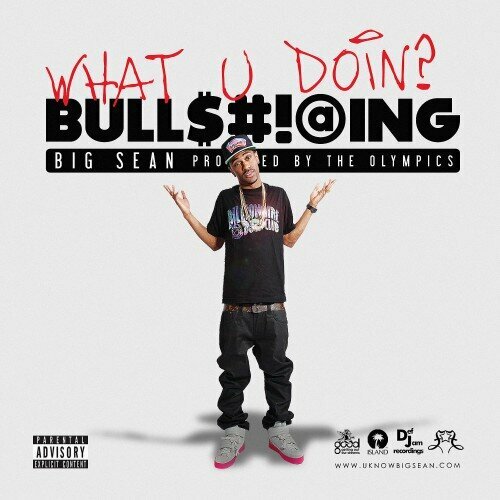 Big Sean talks the new single “What U Doin? Bullshitting”, his upcoming Finally Famous album, speaks about his doubters/haters (@ 10:45), and also premieres the song on WJLB 97.9 Detroit with Dr Darrius. Here’s the dirty/CDQ of Big Sean’s latest single, “What U Doin’,” formerly known as “Bullshittin’.” The Olympicks went ahead and let go of the mastered/final version earlier today, so it looks like this will definitely be on the album. Debut album Finally Famous on its way.